Moon Duo is Ripley Johnson (Wooden Shjips) and Sanae Yamada. Their most recent record “Circles” was released in 2012 on Sacred Bones. Our friend Ryan Muldoon at Revolt of the Apes has compiled a list of 10 questions for Moon Duo in anticipation of their APF 2014 performance. Can you think of an album that you’ve grown to greatly appreciate only recently, after many years of either not “getting” it, or simply dismissing it out of hand? What is it about this album that resonates with you today, and why do you think that wasn’t the case previously? As I write this I’m giving the Fairport Convention album Full House a second chance. I really love Sandy Denny, so I just kind of dismissed everything post-Sandy. I’m reading Electric Eden by Rob Young, about British folk, so that’s why. I’m not really a big folk fan generally but there are certain voices or personalities that I’m drawn to. 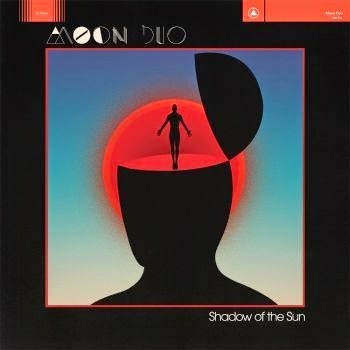 In what ways do you think your own musical evolution has progressed since playing with Moon Duo? Do you find that, in general, the more you play music with another person in a band, the more you understand them as a person? Or do you find that the two things have no direct connection in your experience? I don’t know, maybe playing music can help with understanding. That’s not been my experience really. I think a person could be a complete enigma and you could still have some great jams. As far as my musical evolution, I have no perspective. I’m trying to devolve at this point anyway. I want to unlearn as much as possible. That’s my new goal. What led to the decision to have the sounds of Moon Duo’s “Mazes” remixed by artists such as Psychic Ills and Sonic Boom? What do you learn about your own music – or, perhaps, your own creativity – when you hear these alternate contributions? We just tried to get artists that we liked or admired. The remixes don’t teach me anything about my own process. It shows me what someone else would do. That’s what’s interesting to me. I already know what I would do with the mixes. One of the standout numbers from the “Circles” LP, in our mind, is the song “Sleepwalker.” What can you tell us about the origin of this song? What does the title “Free Action” mean to you? Sleepwalker came from the feeling I get sometimes that I’m in a lucid dream, that everything is completely unreal –which it is. Life is absurd. Free Action means taking life by the balls and giving it a big, loving squeeze. Let’s see what’s piled up by the turntable: Digable Planets, Laurie Spiegel, The Faces, R.L. Burnside, Burzum, White Rainbow, Don Cherry, Henry Flynt, N.R.P.S., The Pyramids. My favorite Sabbath album is Sabotage. The first six albums are all kind of perfect but I just have a thing for that one. There’s a weird energy to it. And the cover art is magic. I’ve spent a lot of time staring at that cover. How does the moon define or describe you as a duo and as individuals, musical or otherwise? Our name loosely refers to the idea of two moons, like Phobos and Deimos of Mars. They orbit the same planet but at different speeds and in different paths. That’s how we approach most of our songs. Any cool memories of your previous visits to Austin Psych Fest? Are there any bands in particular that you are excited to have the chance to see play? I think I played at the 2nd festival and it was pretty small, so it’s been cool to see it grow over the years. Sky Saxon played that year, which was cool. I’m a big Seeds fan. I want to see everything this year. I want to discover something new. What are the necessary elements for a good live performance in your mind? Do you find that playing music can deliver you to a mild (or perhaps not so mild) altered state? Do you think of yourself or the band as feeding off of the reception and energy of the assembled audience, or does your experience on stage feel more separate? We definitely feed off energy from the audience. I’m introverted, so I kind of need that. I don’t know what makes a good performance. A lot of the music I like is very inward looking, so I don’t expect to be entertained by those types of musicians. I don’t need someone to prance and dance about, but I know some people want a show. Better for me not to think about it too much. Kahil Gibron said the following: “We are all like the bright moon, we still have our darker side.” Your thoughts? I have a sudden craving for a fortune cookie. What’s next for Moon Duo? We’re beginning to work on a new record, or at least thinking about it. Hoping to get a live album out first.